A new UCI Pro Tour race is coming to Colorado, the route has not yet been announced, but the Tour's official name will be Quiznos Pro Challenge, after it's main sponsor Quinzos. Quiznos is an international sandwich company. The first ever Quiznos sandwich shop is located just blocks from our state capital in Denver, Colorado. The Quizno Pro Challenge race dates will be August 22-28, 2011, 7 days of racing. This morning a good-size group of cyclists and supporters gathered outside the state capital building in downtown Denver. The crowd listened (well, some of them could hear) to Governor Bill Ritter and Lance Armstrong announce that a pro race will indeed be held in August 2011 in Colorado. This is exciting news. There has been much talk, and hope, but the race is now a reality. Thank you Quiznos! It has been sad to see the Tour of Georgia and the Tour of Missouri fade away in this past year. Cycling fans now have a new race to look forward to, and right here in Colorado. Plus August is the best time of year to ride a bike in Colorado and to be a tourist. I listened as Armstrong said he felt certain that the European riders would look forward to coming here to Colorado to ride. "You have good hotels," he said, to laugher. We also have an active population, good roads, great towns, and enthusiastic fans. I am proud to have some of the best cyclists in the world heading to Colorado. For me, it was totally cool having the event and Lance Armstrong cruising through my neighborhood park this morning in Denver. Surreal really. I certainly didn't chase Lance Armstrong all over France while I was there just weeks ago, but he just rode through my hood this morning! 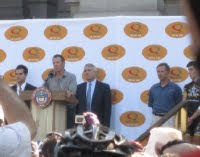 The announcement of the Quiznos Pro Challenge race by Colorado Governor Bill Ritter. this is Ron Keifel (former 7-Eleven team rider and US National Road and Time Trial Champion) cruising through Washington Park in front of me, pulling his child in the trailer. As Phil Liggett would put it - many of the Heads of State (in Colorado cycling) turned out today in support of the race.